Axel Foley: "Yeah, but tell me something, what's the charge? 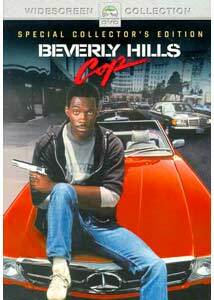 Beverly Hills Cop #1: Possession of a concealed weapon, and disturbing the peace. Axel Foley: Disturbing the peace? I got thrown out of a window! What's the f***in' charge for getting thrown out of a moving car, huh? Jaywalking? MPAA Rating: R for violence, profanity, adult content. That certain something that separates movie stars from the rest of us�if I could just describe it, these people wouldn't pop off the screen. But there's something especially galvanizing about watching someone onscreen with that sort of presence before the self-consciousness of being a Big Movie Star creeps in�the difference between, say, Kevin Costner in No Way Out and Kevin Costner in Message In A Bottle. Beverly Hills Cop catches Eddie Murphy accelerating up that trajectory�after a hilarious stint on Saturday Night Live and his early film successes in 48 Hours and Trading Places, this is the movie that nudged him over the top, that ratified his status as a comedy god. Maybe he hasn't made such terrific choices more recently�things like the Dr. Dolittle movies seem unworthy of his talent� but looking back at this movie from nearly twenty years ago, it's easy to see why Murphy was such a supernova. Murphy plays Axel Foley, Detroit police detective, loose cannon and general wiseacre. His old running buddy Michael Tandino (James Russo) shows up, six months out of prison, which he's spent working for a high-flying art dealer in Beverly Hills named Victor Maitland. Tandino is on the lam, having helped himself to some of Maitland's bearer bonds, and a couple of Maitland's thugs come calling: Tandino gets whacked outside of Foley's apartment. Being a proper movie cop, Axel takes matters into his own hands�he cashes in his vacation time, and drives his beat-up old Chevy Nova out to Beverly Hills, to do right by his dead friend. Minding him are two of Beverly Hills's finest, Taggart and Rosewood, played by John Ashton and Judge Reinhold�Brest frequently professes his love for comedy teams, and these two are very much in the model of Laurel and Hardy, or Ralph Kramden and Ed Norton. The story is serviceable enough; it's little more than a necessary structure on which to hang the scenes, because this is principally a movie about the behavior of its main character. This can lead to some painful bits of exposition�Ronny Cox, a fine actor playing a Beverly Hills police lieutenant, does a lot of the heavy lifting here�but the movie is funny enough that you'll probably willingly go along for the ride. It's also not a movie above presenting us with improbable coincidences, like a strip bar about to be robbed by a couple of badasses just moments after Foley, Taggart and Rosewood take a seat. Murphy carries the mantle of the movie, providing just about all the punchlines, setting the tone for nearly every scene�the filmmakers seem to know that they've got a thoroughbred, and they're going to ride that pony to the winner's circle. Murphy is lithe, funny, dangerous�he's like all four Marx Brothers rolled into one, and Beverly Hills is his Margaret Dumont. The movie is of its time, sure�when men still wore three-piece suits, before smoking was criminalized, when women wore these amazing helmets of hair�and its influence has been profound, if not always for the good. Axel Foley is the archetypical wisecracking smartass cop, an antidote to years of laconic, Dirty Harry-style movie policemen, and Steven Berkoff�a fine and menacing actor, but who occasionally seems like a cut-rate Anthony Hopkins�is the first in a long and boring line of Eurovillains. And the ending is rather grizzly for a comedy�but not violent enough to stave off two sequels so far. Especially noteworthy are three actors in relatively small parts, all of whom make big impressions: Paul Reiser as a nosy colleague of Axel's in Detroit; Bronson Pinchot and his impossible-to-place accent as Serge, art dealer and espresso maker extraordinaire; and briefest of all, Damon Wayans, as the buffet attendant who supplies Axel with the bananas necessary to stuff up the tailpipe of a Crown Victoria. Image Transfer Review: There's the occasional bit of debris in the video transfer, but generally this DVD looks pretty good. The colors are sometimes a little flat, which may be due to the film stock being used at the time, or to the almost obsessive use of slats of light�there isn't a window in this movie that doesn't have Venetian blinds, with the blazing Southern California sunlight throwing horizontal lines across every possible surface. Audio Transfer Review: Audio sounds reasonable�dialogue is easy to make out, but the music is a little tinny. (Much of this is due certainly to Harold Faltermeyer's influential score, virtually all of which is played on a synthesizer.) The shootout toward the end gives the rear speakers something of a workout; they're otherwise reserved for simple sound effects like phones ringing. Extras Review: Director Martin Brest's commentary track is the main attraction here�he's a charming guy with a nice presence, but he readily admits that he recorded it on a lazy Saturday Santa Monica morning, and that he hadn't seen the movie in years. So unsurprisingly his recollections are pretty free form, and he's frequently content to watch along with us. ("I don't know if this qualifies as commentary, but I'm just getting kind of hypnotized watching this here.") He is of course chock full of nuggets�one of my favorites is that Paul Reiser's character was named Jeffrey in a waggish tribute to Jeffrey Katzenberg, an executive at Paramount during the making of the picture. And I especially like his description of the movie as "a weird hybrid between In the Heat of the Night and The Beverly Hillbillies. "The longer feature�Cast and Crew Interviews�and the two featurettes�Glimpse Inside the Casting Process and The Music of Beverly Hills Cop�use many of the same interviews with the filmmakers, and they frequently repeat one another, and Brest's commentary track. (The three supplements use many of the same stills and clips from the movie.) The Cast and Crew is pretty thorough�interviews with both credited screenwriters, with Brest, and most of the principal cast members: Murphy, Reinhold, Ashton, Eilbacher. The first portion of it is sort of a valentine to the late Don Simpson, one of the film's producers; and I found Reinhold particularly unsettling, for he talks about Beverly Hills Cop as if he were Norma Desmond describing her silent successes. Brest is pitch perfect, though, in describing his image of Reinhold and Ashton as an old married couple. One of the principal themes is this: until two weeks before shooting, Sylvester Stallone was going to star. (Mickey Rourke and Al Pacino were both seriously discussed for the role, too.) So the whole thing was cast and ready to go as a Stallone movie, and everybody abruptly shifted gears. The script changed, of course�and much of the Stallone stuff that got cut made its way into Cobra. But the cast remained�for instance, Eilbacher went from love interest to old friend, the unspoken assumption being that the studios in 1984 weren't prepared to have an interracial romance in something other than an issue movie. Casting director Margery Simkin is especially good�this was her first feature, and she well remembers the impact of the curveball, when this became an Eddie Murphy movie. This is as close as Eddie Murphy has gotten to a film worthy of his enormous talents. Much of it remains laugh-out-loud funny, even after repeated viewings, and a pretty generous serving of extras make this edition of Beverly Hills Cop a keeper.